Once again this year, we have joined in the themes shared by the Baja Four, the four Unitarian Universalist congregations here in Southern Arizona. Every Sunday in September, we will be looking at the facets of the Spirit of Our Covenant. We are a people of covenant who promise to hold one another in sacred relationship. This is not a slight of hand for doctrine or creed, one's belief is so important to us we will not dictate it to them. Instead, we covenant to live with one another through diversity of belief finding meaning together. This month we will explore the spirit of our covenant in its Heritage (Sept 4), Aspiration (Sept 11), Behavior (Sept 18) and Legacy (September 25). Our shared spiritual practice this month is: COLORING. From the work of the Rev. 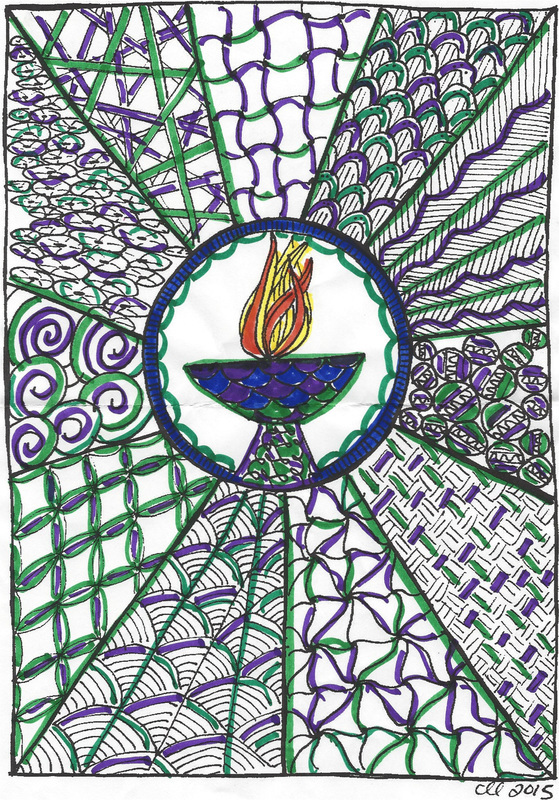 Dr. Cynthia Landrum, author of Filling the Chalice, we have a coloring template (see below). You can either download the image or pick up a hardcopy of it at our Welcome table. Color it in a slow and meditative fashion. Your finished pieces are being shared here, during worship and over our gratitude altar! ​come from the work of the Rev. Dr. Cynthia Landrum (center chalice).